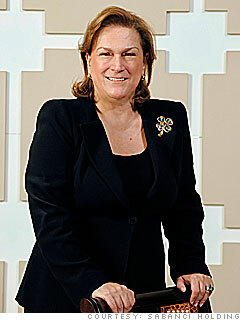 Sabanci, 55, oversees more than 30 group companies in Turkey, which generated total revenues of $12.2 billion in 2009. Sabanci jettisoned the group's 65% stake in ToyotaSA to focus on core businesses like cement, energy and retail. She has also launched a transition into low carbon emission projects, with the company's cement group invested in production of electricity from waste gas -- a first for Turkey. In her spare time, she runs a private vineyard in northwest Turkey, producing a wide range of wines from Bordeaux-style to Chardonnay.